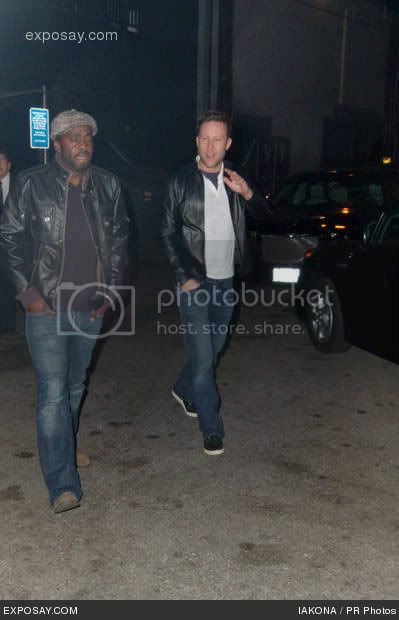 nmviewer at TWoP posted more Michael pics - on Saturday night, he was hanging with Chris at a Club called M16! Hi Michael!!! Thanks for leaving the hat at home. Chris looks a little sleepy! He's wearing those jeans well! YAY the boys are hanging together again! God, Our Boy looks great, doesn't he?? Woohoo! Another pic of Michael with Chris and without a hat! Yes! He's such a friendly soul - love the wave! I just wanna kidnap him and cuddle him. lol He's so adorable!!! He looks like you could just take him by the hand & lead him hone! I bet Michael would LOVE to take Tom out but Tom seems to be back in hibernation mode. I do love that old photo of Michael, Tom and Sam J. all walking to the Seinfeld show. wow...Michael looks as hot as usual!! He's all cute & smiley! lol @ Michael and his royal wave. The boys saw a lot of each other this weekend! You mean "More Micheal HAIR!" Maybe he lost THE HAT!!! ♥ for our red-eyed boy!! Seems to have had a fun weekend! Yay! I love that our boy has been out and about more recently, it's like an early Christmas present. I love that our boy has been out and about more recently, it's like an early Christmas present. It is nice - we went without new pics for quite a while! He looks sleepy & cuddly! Gorgeous Michael, hanging out with Chris -- definitely a day-brightener. Thanks for posting! He seems to have had a fun time with Chris last weekend!